April has now kicked into gear and spring is well on it’s way. It’s a time for rejuvenation and reinvention, and maybe you are looking for some fun new diversions that offer excitement and a little cash, if you’re lucky: well, look no further. 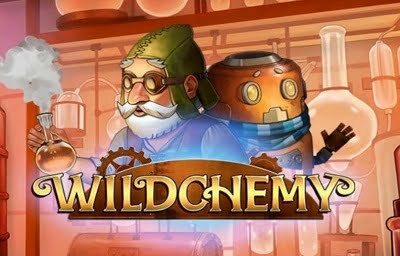 Wildchemy Slots is an exciting take on boring old chemistry, designed and released by little-known developer Relax Gaming. This title has magic portals, surprising game play and potential wins of 500x your wager. Most players will be excited by the exploding Scatters which happens when winning combinations hit the reels and explode and new ones take their place. Not to mention, if any of the symbols match up with those in the aforementioned magic portals, you’ll get a higher return on your investment. Another great feature of this release is that during free spins mode, a third portal appears, further increasing the chances of a high-paying result. With various ways to earn free spins, matching symbols that transform into Wilds, there is endless entertainment throughout the action. Magic continues to be on the menu today thanks to Novomatic’s The Great Gambini’s Night Magic Slots which was also just released, and as the name suggests, it contains wizardry and enchantment, supported by great graphics. Novomatic has gotten some slack for a lack from jaded members of the online community when it comes to their schedule of putting out new and interesting machines, however, this one definitely packs some punch. This title offers a number of special features which are randomly triggered as the action progresses. These include modifiers that arrive following spin losses, free spin rounds that are awarded when three or more scatters fall, a “Symbol Swap” feature and shifting symbols. Furthermore, the Great Gambini has the power to re-do any of these great features on a whim, so you’d better try to stay on his good side. To try out these crazy and possibly profitable titles, head on over and open an account at the Videoslots Casino today and check out their awesome offerings.